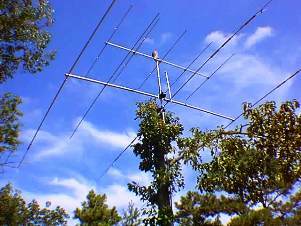 Choosing a wire antenna system is one thing. Finding somewhere to put it up is another. Particularly if you’re short on supporting structures around the home environment. 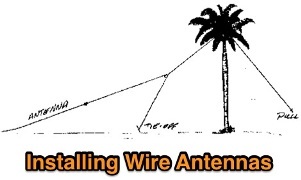 Acknowledging the fact that not all hobbyists have access to a galvanised steel tower on their property, here’s some helpful advice from members of our Dx Adventure Radio Club (DA-RC) for hams looking to install a wire antenna in a ‘challenging’ home environment. 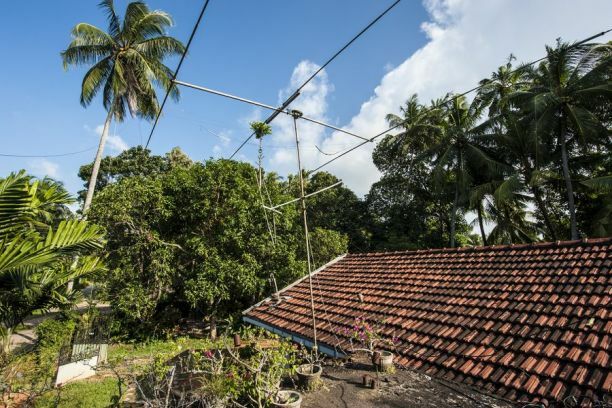 The first thing you need to do, according to 43DA124 John, is “establish where you’re ‘legally’ able to erect an antenna without your neighbour being able to rip it down. After you’ve established where your antenna will go, 14DA281 Michel (sadly R.I.P.) was big on consulting the XYL to ensure the available space and what you intended to do with it, met her expectations of what was appropriate and what wasn’t. While YOU might see the grove on your property as the perfect backdrop for a multiband OCF dipole, for example, she might’ve pigeonholed it as an ideal spot for the kids’ cubby house! 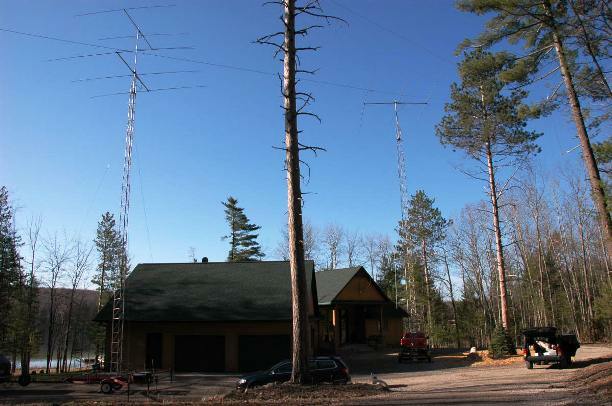 Fortunately for ham radio ops, nature provides us with a vast supply of tall, non-conductive, self-maintaining supports to house our antennas. We know them as ‘trees’ hihi. While in some neighbourhoods trees have been axed to provide unobstructed views of majestic landscapes (e.g. coastal seascapes, mountains, etc.) as well as to provide clearance from power lines and people’s houses, many guys reside on properties where trees are valued and therefore in rich abundance. 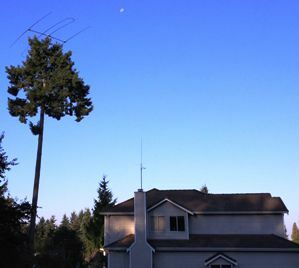 No doubt John and other guys will agree that having a neighbour who’ll permit you to use one of his trees to support an end of your antenna if need be is a HUGE bonus also. Just another reason to make sure you’re in the good books with your neighbours! 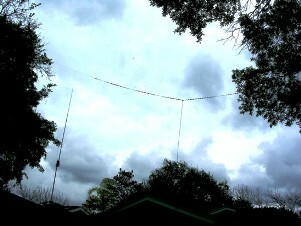 Using trees for antenna supports, however, provides a ‘catch 22’ scenario. On a still day, with your antenna strung from the very top limbs of a couple of well placed, awfully tall trees, trees are fantastic! When the trees and severe WX (i.e. storms with strong wind gusts) combine to create havoc, however, the outcome is potentially catastrophic and this is the other side of the coin when it comes to employing trees as antenna supports. In strong winds, when trees move in contradictory directions and the only thing trying to hold them together is your antenna and its support ropes — then kiss your antenna goodbye. For this reason, tree hung antenna installation requires careful consideration indeed, however, once conquered, they’re worth all the effort! 1. 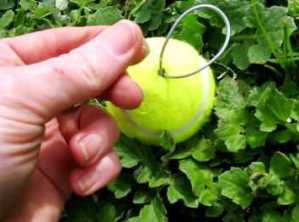 Toss a Ball: Tie a light string around a rock or cricket ball and toss it over a suitable tree limb. 2. Fishing Cast: If you’re a good fly fisherman like Sam in Eastern Kiribati, you can lob a line over any limb of choice with a fishing pole and reel. Sam recommends using lightweight monofilament fishing line or something similar as the first line up the tree. According to Sam whose home is surrounded by towering coconut palms, “a light weight line produces minimum drag on whatever projectile you’re hurling over the tree…” This simply means you can get your line higher in the tree for the same effort. 3. 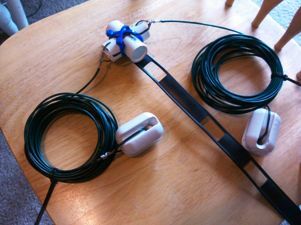 Slingshot: Bjorn in the Philippines suggests using a powerful slingshot which can shoot a lightweight fishing sinker and light weight monofilament fishing line about 50 feet up a tree. 5. Climb: Younger DA-RC members have been known to scale trees to fix an antenna and while this method is non-preferred due to obvious safety concerns (i.e. you fall you die), in some cases, it might be the only way of utilising a tree for support. Of course, having a capable and experienced climber, one whom is not afraid of heights, is essential! 6. 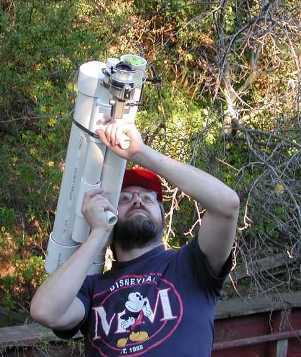 Pneumatic Launcher: Throwing an object over a limb is the easiest, but will not reach very high, and there’s a big chance of getting the object stuck. Slingshots reach higher, and Bows reach higher yet. The major problem with all these systems is the projectile. A lead sinker, arrow or crescent wrench can do a lot of damage if it lands in the wrong place. If you’re putting a line over a tree in your yard, there are often local ordinances against using slingshots and bows. What’s needed is a really safe projectile, and a means for getting it over the tree precisely for maximum safety and effectiveness. 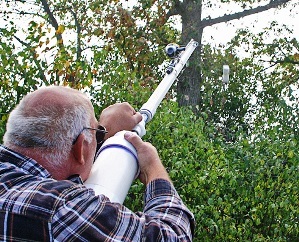 If you have a really tall tree, then a Tennis Ball Launcher will allow you to go higher than most slingshots or bows. Even a small Pneumatic Tennis Ball launcher can reach up more than 150 feet, and it’s possible to go much higher with the more effective models. 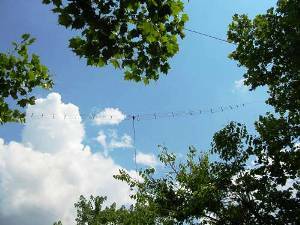 Whatever installation method you select to install a wire antenna from a tree, though, ‘safety’ must be your ultimate priority. Losing an antenna due to severe WX may set you back a few hundred dollars but they are easily replaceable. You, however, are not! Hopefully, this article has opened your eyes to a few tall, non-conductive, self-maintaining supports on your own property. Unlike galvanised steel towers, these ones might drop a few leaves and the occasional branch every now and then but they won’t cost you a mint either. In fact, once you’ve managed to secure your support ropes to a limb or two, you probably won’t even notice the difference! 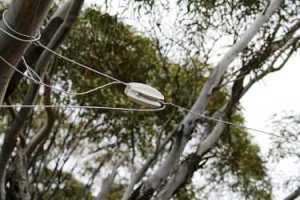 How about attaching a rope and a suitable weight, to the insulator holding the antenna, and pass the rope through a loop, attached to the tree, where possible. This so that any swaying of the trees, in windy weather, the slack is taken up, or let out, according to the weighted rope.